The CopperHill AIR Warehouse is a solution that contains several tools to help companies aggregate all of their data into a central repository – or a data warehouse – so that they can see a bigger and clearer picture on how their company is doing. With our CopperHill AIR Warehouse, data can be extracted from any number of operational data sources, cleansed, transformed and then loaded into the data warehouse. This provides your company with a cross-organizational view of consistent, consolidated data. 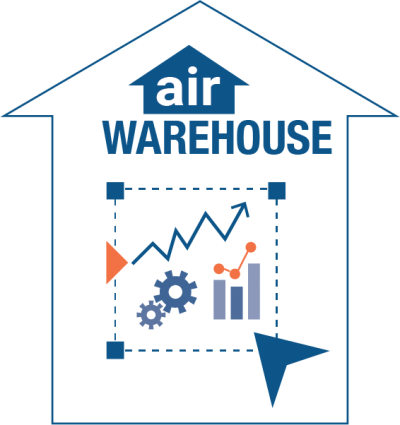 The AIR Warehouse eliminates silos, spreadsheets, and the frustration that comes with manual, incorrect calculations. Once the data is in the warehouse, you can choose to push the results back into your operational systems, or you can choose to analyze it. If you don’t already have a business intelligence tool, we can help you evaluate what will be the best fit for your environment. You can also overlay your existing BI on top of our AIR Warehouse: it is BYOBI! WAVE, Jasper, Qlick, Tableau – you bring your BI tool to the table and leverage our scalable, high performance data warehouse.